Today I’m joining Ginny’s Yarn along with a finished object. My Gemini is finished. And the blanket is growing as well. Look how big it is already! It is starting to be heavy and bulky but that is how it is supossed to be. Only the socks have not been knit this week but I will try to get on with them this weekend. As far as reading is concerned I started a new book which seems to be a fairly easy read: “Der König der Komödianten” by Charlotte Thomas. It is an historical novel based in renaissance Italy where a yound man ends up travelling around with a group of actorswho perform the famous plays of the Commedia dell’ Arte. And the the weekly nail question. Today is the day before a bank holiday thursday and tonight is the “Night of the Clubs” here in Düsseldorf so I opted for something springfresh and glittery. I applied the gold glitter polish “make it gold” from essence over a white polish with a slight touch of pink (“fiji” from essie). But now that my cute little Gemini is finished, what should I knit next? I really wonder because I have three different things that I want to do and that I already have yarn for. And I can’t decide what I want to start with. I have yarn for a top that should be based on this Lana Grossa dress just without the skirt part in a quite similar colour to the pattern. I have yarn for a Popsicle dress. It is grey and an acid green. 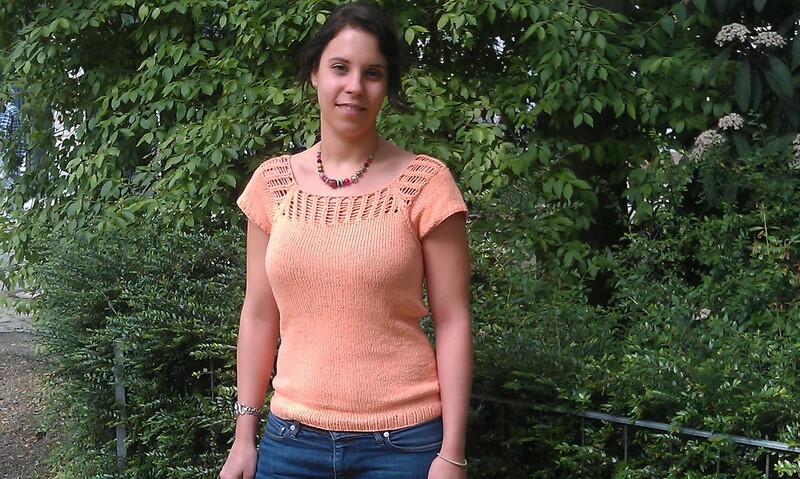 Or I could make a Modern Lace Henley because I think the orange cotton yarn I have from my mum would be perfect for it. I really need your help to decide. What do you think? This entry was posted in Knitting & Crocheting and tagged Blanket, essence, essie, fiji, glitter, make it golden, Nailpolish, Top, Yarn Along by kathatravelling. Bookmark the permalink.